What is it: Confused! A plane-inspired car with bike tendencies. Note the name, which stems from its ability to 'carve up' the corners. Turbocharged engine capable of 185km/h with a potential lean of 45 degrees either side, plus the cool-looking jetfighter cockpit. 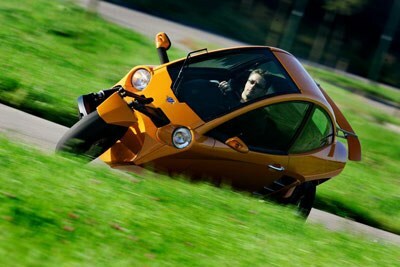 A three-wheeled car that steers like a car but leans into corners like a motorbike will be one of the special stars of the Melbourne Motor Show. Carver One gives new meaning to "driving at full tilt", its single front wheel leaning into corners while its rear wheels also steer but remain firmly planted on the road. Melbourne Motor Show opens at 5 pm on Friday 27 February at the Melbourne Exhibition Centre, and ends at 6 pm on Monday 9 March. Designed by Dutch aero-engineers, Carver One is designed to capture the spirit of a motorcycle or downhill skier with the stability of a car. Carver One drives its name from its enthusiasm for "carving" up winding roads, leaning its fighter-plane cockpit just the right amount for each corner. Its turbocharged engine and light weight give it a top speed of 185 km/h and economy of 6 l/100 km, reflecting its philosophy that motoring exhilaration is about much more than just power. Carver One can lean up to 45 degrees in either direction, and can swing between one side and the other at a rate of 85 degrees per second. The jetfighter-like cockpit seats two in leather-lined comfort, one behind the other, and the driver controls the swooping action through a car-like sports steering wheel. Tilt indicators on the dash are a clear hint of its amazing capabilities, with its 17" front wheel both steering and tilting, and its 15" rear wheels adding active steering to the package, all with a driver-switchable choice between comfort and sport modes. Dynamic Vehicle Control (DVC™) automatically adjusts the tilt angle of the cockpit to the speed and acceleration of the vehicle and, true to its aviation roots, its mechanical-hydraulic systems include a duplicate back-up system for fail-safe operation. Melbourne Motor Show is organised and promoted by the Victorian Automobile Chamber of Commerce (VACC), through its dealer division the Australian Automobile Dealers Association (Vic).